Cranes and live power lines are a dangerous mix, and disturbingly, a large proportion of crane-related electrical incidents involve pick and carry cranes. These cranes, by virtue of their design and use, add an extra element of danger. Raising and extending the boom is only part of the risk; they can also come in to contact with electrical hazards by travelling with the load (especially backwards), and when the ground is uneven, the risks are even higher. The ‘No Go’ Zone rules describe minimum safety requirements that stipulate the minimum distance required between overhead power lines and the work being performed. Each state in Australia has its own safety regulations and requirements that all personnel need to be aware of when carrying out a proper pre-work safety assessment. The most desirable plan is to avoid work near electrical assets if possible and to arrange to have the power cut, if feasible. If work must be carried out near power lines, obtain permission from the electricity distributor in the state where the work is being carried out. 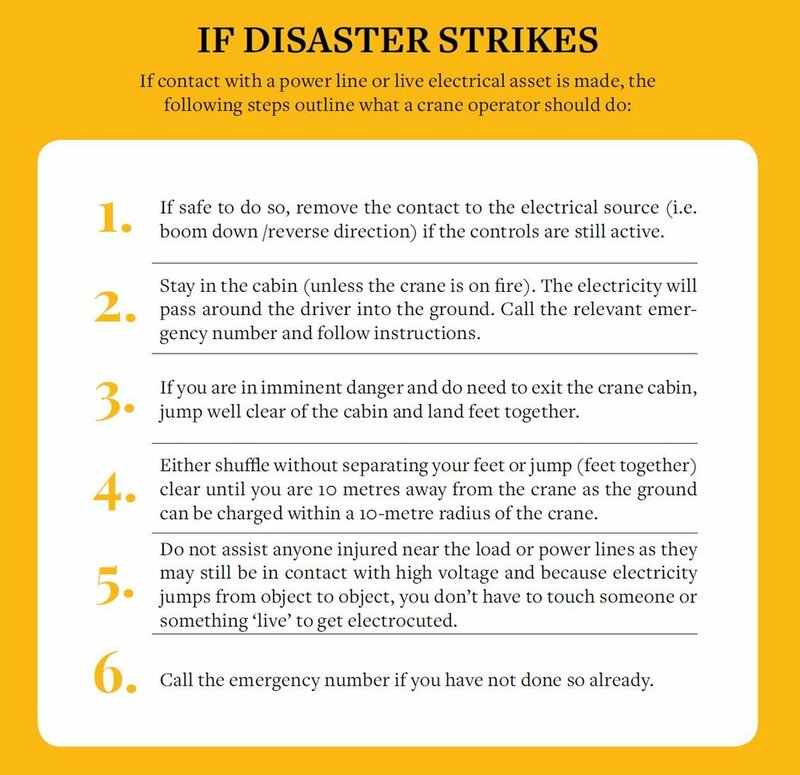 Notify the electricity distributor when planning work and before commencing work. A thorough site inspection, risk assessment and lift plan are also crucial to mitigating potential risks and hazards. When a Safe Work Method System (SWMS) is completed, risks from electrical hazards will highlight the need for a spotter. Dogman and riggers on the ground near the load are most at risk from power line contact as the electricity passes from the electrical asset, through the boom, rope and load. Whether it’s high voltage or not, the consequences of contact are extremely high especially for the dogman as he is usually holding the load or a tagline which creates a path for the electricity to reach the ground. The dogman is not a spotter - his job is to watch the load. The data from serious incidents of this nature involving pick and carry cranes to date has often indicated the lack of presence of a dedicated spotter. The spotter must remain at the task for the entire time the crane is operating in accordance with the SWMS. The spotter may only observe one crane or piece of operating equipment at any time, so their attention is always focused. They must provide an early and effective warning to the crane operator of any potential encroachment on the ‘No-Go’ Zones. Spotters for overhead electrical lines must have completed an endorsed spotter training course by a registered training provider and be competent in the design envelopes for the equipment/plant being used. Their familiarity with the actual lift plan for operation including any travelling or crawling with the load is crucial. Construction is a high-risk activity and lives are at risk, so safety ‘best practice’ is imperative. If you need more information, contact The Crane Industry Council of Australia (CICA) here.